“Viños de Encostas” is the personal project of Xose Lois Sebio. He´s searching for more direct wines, with unique personality and more risky processing of zones with a very marked identity. Sebio makes wines in areas often neglected or unusual, with different preparations. Some traditional and others innovative, but they all try to make the best of high quality grapes. They are vineyards difficult to manufacture as a conventional wine because of their low performance and high costs in winegrowing. The viticulture method is sometimes ecological or biodynamic and others conventional, depending on the location of the property, its variety and its orography. The objective is to obtain grapes that express the most of the identity of the area where they come from. He always tries to respect the personality of the soil and the variety. He searches for grapes that mark the identity line and the wine purity instead of us trying to direct them. All wines are made with minimal intervention and without products outside the wine. Low sulfur is used. The work line of Viños de Encostas is a less commercial line on the type of produced wines, but more authentic. Away from conventions and fashions, with the sole intention of expressing soil, area, wines with soul and personality. They are wines with very exclusive elaborations, with few bottles since they come from very small vineyards, with old vines and with extreme viticulture. Collectable wines for lovers of the authentic and different. They are wines without makeup or tricks, only pure “Viños de Encostas”. Each year, several projects are developed but not all of them come to light, only those who deserve to be named Viños de Encostas. 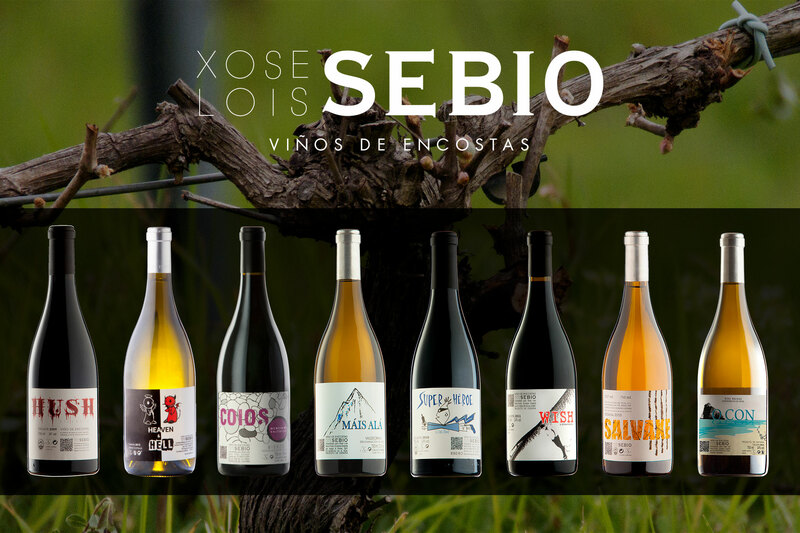 Sometimes these projects are made by Sebio himself and others with outstanding producers, with unique vineyards and grapes. These joint projects are sometimes for making wine and other for a common project. Depending on the years we’ll, have one wines or others. The image of each wine is a modern and different image, based on labels that are illustrations. The ones who see them will not remain indifferent. The aim is to highlight and draw attention in an original way and with personality. The labels are devised by Sebio who transmits the concept to the designers; they explain what Viños de Encostas should be. The names refer to processing, to the property or lifetime situations.